How superfluous it must have been for a man like Richard Adams to recite such obvious details as part of a foundation for his brilliant novel, but they exist, one gathers, out of necessity – not to exemplify the nature of the story, but to highlight the failure of industrialized society to recognize the terror they inflict on the natural order of things. His story is a sad prayer to the most mistreated of animal species, and yet so much more than that: an ironic (and often dark) declaration against modern civilization that spares no feelings or details in its conviction, and finds a universal cruelty in the desperate search for survival. Rare is it for us to acknowledge those themes when we are young and caught up in the throes of an exciting adventure, but time erodes the whimsy as easily as it shatters the barrier between fantasy and reality. Did Adams foresee that his young readers would catch onto the more morose acknowledgments of his yarn as they grew into the downtrodden perspective of adulthood? Could he have anticipated the penetrating nature of his plot and how thoroughly it would stick with us through the long crawl through age? The buried subtext of “Watership Down” has little business in a book (or a movie) without some sense of seasoned perspective, and yet both were made, shockingly, by first-timers: Adams a young writer whose work barely made it past publishing cynics, and Martin Rosen (the film’s director), a novice to ambitious studio projects, who acquired the responsibility after his predecessor – the widely regarded artist John Hubley – died during pre-production. Their commonality is the engine for which the story’s hard themes seem driven, in the hands of men that refuse to have their voices carried by the undercurrents of conventional storytelling. 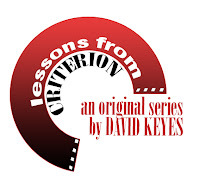 Great challenges, furthermore, plagued them well into their creative thrusts; Adams was warned habitually that selling his novel as a kid’s fantasy would be an uphill battle because of how morose the subject matter was, and the British studio that funded the big screen version placed great interference in the endeavor, fearing the deep degree of violence that a faithful adaptation would require. Why challenge a cartoon at all, though, given the dexterity of the genre’s artists? To a populace that had been raised on the more straightforward fables of the Disney studios, a story like this could have become a colossal loss for investors. Consider the visual suggestion that comes with a plot about animals surviving in a world overrun by deadly threats; the very core of the idea seeps a blackened nature that must feel so dissonant with the standards of the medium. But the arrival of the film in 1976 could have been, some might say, a silent blessing. While Disney was caught in a path of uncertainty in the preceding years, notions of adult themes infiltrating the work of a new generation of cartoonists were beginning to take root, and with all the enthusiastic velocity of pioneers discovering hidden treasures. 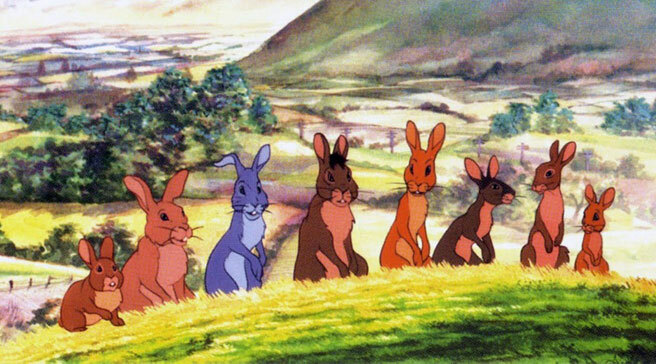 A handful of minor achievements in the late ‘70s suggested the transition of the medium to the sensibilities of more evolved thinkers, and Rosen’s “Watership Down” heralded that prospect by being the riskiest of them all: a movie with a story of youthful simplicity that also displayed the macabre enthusiasm of illustrators who had no qualms about visualizing sacrifice and death on screen, often in very frontal increments. 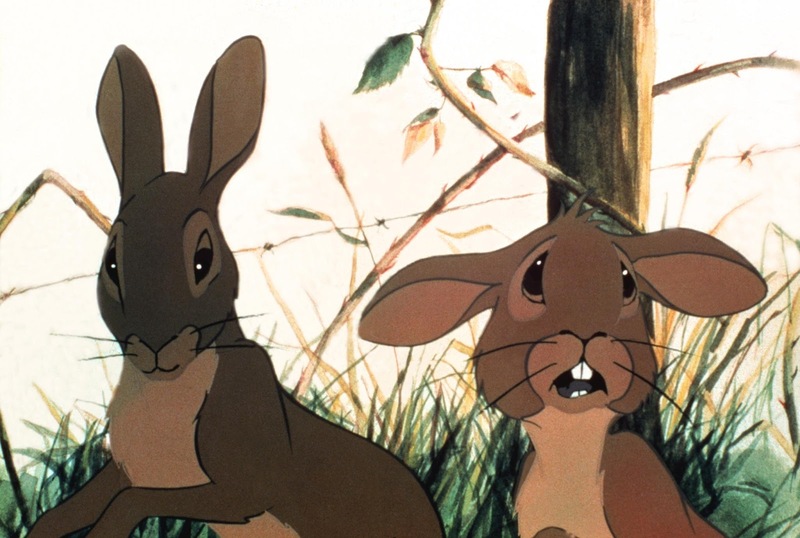 Those words echo consciously in the thoughts of the many rabbits that populate the film – some more persistently than others, but always with a degree of loyal conviction. When we join them, the camera takes distinct interest in two: Fiver, a shy and cowardly young buck, and Hazel, his brotherly protector. They wander the grassy fields just above their warren with docility until Fiver takes notice of a strange construct sitting at the edge of the glade: a giant signpost with a discarded cigarette resting underneath, still smoldering. Audiences are immediately cognizant of the impending reality, but Fiver intercuts his thoughts (“it feels oppressive, like thunder”) with swelling anxiety and graphic visualizations (namely, a field soaked in the blood of dead rabbits). Others are not so easy to convince of impending danger (is it all just the ramblings of a crazy animal, or is Fiver some sort of prophet? ), but a small cluster of peers find a cautious plausibility in his warnings, inspiring them to collectively abandon the warren before the threat of man costs them all their precious lives. The world beyond the comforts of home, alas, is a nasty and frightful obstacle course, and the movie documents this journey without much regard to overreaching sympathy. Some – especially in the earliest part of the film’s release – found that prospect discouraging to young hearts, but it does not come at the expense of other painful realizations. Consider a moment when the rabbits are nestled under a cluster of crops, one wanders beyond the shade to feast on flowers and a menacing shadow in the skies snatches it away. Most cartoons of any degree would pause and mourn the fate of the poor creature, but “Watership Down” has no patience for that; the surviving rabbits hesitate only for a moment to allow the reality to sink in and rapidly move forward, lest they become added casualties. The entirety of Adam’s thoughtful story arc is that death is, unfortunately, inevitable without caution, and for animals that are natural prey, the only way to honor one’s memory is to move urgently forward. The survivalist agendas of the rabbits are not just compromised by the threatening nature of natural predators. The greatest villain in this story is, ultimately, their own brethren – specifically two gatherings of them that exemplify the consequence of violating natural instinct. The first of many subplots that Hazel and his troupe of followers encounter is a lowly warren where they are offered sanctuary. Those rabbits, an assortment of sluggish and mopey sorts who speak in fatalistic euphemisms, are a visualization of inner contempt; long resolved to the inevitability of mortality that the “black rabbit” has placed on them, they freely accept the provisions of humans above ground, and do not resist the suspicion that they are being bred for consumption. When Bigwig, the muscle of Hazel’s group, wanders through a nearby field and is caught in a snare, his near-death encounter is more than just a moment of tension: it is a framing device that underscores new realities for the children of El-Ahrairah, who will acknowledge this finding with morose awareness and allow it to inform their perspective for later, when the third act requires them to face their own kind in a showdown with a powerful warren of fascist rabbits that seek to enslave them. Any tale that must acknowledge such piercing truths does not arrive there without imbedding genuine values in the core characters, however. Many furry little rabbits occupy the foreground of this rather busy little epic, but they are each as distinctive as any of the players in a live action ensemble of a Robert Altman endeavor. 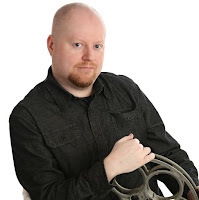 The heart of the film is Fiver, the seer, who guides his brothers on their journey by tapping into the intuitive nature he is blessed with; it seemingly takes hold at all the critical junctures of the plot, particularly those that carry the aura of climactic confrontations or critical warnings. By contrast, Hazel’s endearing sense of responsibility gives him added focus as a protector and confidant, and there are moments between he and Fiver that are equal parts dramatic and touching (the movie’s only song, a ballad that carries over a frantic search, structures their relationship in marvelous poignancy). Meanwhile, the brawn of the operation is realized in the stubborn but audacious Bigwig, a former captain of the warren’s guard who monitors things closely, speaks up on hard truths and even has the nerve to invade the warren of the enemy in order to liberate a group of does needed for repopulation (a realization stressed further by an obnoxious gull named Kehaar, the film’s one spot of comic relief). That they all speak in British accents while adopting such roles is not coincidental; just as writers of some of the best fantasies have used their own cultural distinction to create characters of clear nobilities, their precision of dialogue adds weight to our admiration. A good rabbit wandering among the grass, after all, is not all that interesting unless he is able to remark wryly about his strange destiny. What the animals represent – singularly and collectively – is the virtue of endurance in a world of relentless struggles, and for both Adams and Rosen to balance those prospects (on paper and on film, respectively) without shifting the tone into hopeless melancholy is as remarkable as it is skillful. Furthermore, the austerity of the material did more than shock its audiences; it also ignited a passion within aspiring artists that carried well over into later decades, even at the heart of the enterprise. The great Don Bluth, for example, openly admitted great affection for the film, and just as his “The Secret of Nimh” can be seen as an elaborate remake of “Watership Down,” so does he endure in the echelon of famous animated film architects like Rosen does: by being a voice of evolution in a sea of passive followers. And while the attempts at capturing the more menacing overtones of the story eventually made their way to the heart of the Disney cannon (“The Black Cauldron” represents the pinnacle of that prospect), the tide would eventually shift back to family-oriented values for animated features. If that implies anything definite, it’s that the motivations of this story are so specific to one influence that many dared not trivialize it by exercising in cheap imitation. Unlike the greedy sorts of action-oriented Hollywood, you can say, it has always been easier for animators to resist compromising their integrity. Yet the visual aesthetic, a departure from the more meticulous style of the studio cartoons, has gone on to influence offshoot genres across generations of new artistic standards. The backgrounds, all painted in deep saturating watercolors, are not just images behind moving figures – they are works of art that enhance the action. The characters, drawn with rough edges and fluidic movement, are emphasized with remarkable distinction; the rabbits of the central story look much different than those in the subplots, and each adopts a look that embodies the virtues (or the curses) of their respective environments (is it a wonder that the military-like rabbits, which are Nazi-esque in structure, have blue eyes?). And the sharp angles of several shots – some of them overhead, others from low in the grass – can be considered direct violations of the animated standard; they seem to come from a source of inspiration beyond the vision of a mere director of cartoons, and give the picture a cinematic quality that is irrefutable. Nearly four decades have come and gone since Rosen’s faithful adaptation worked its way through theaters, but it persists even now – a stunning feat given the grand age of new technology and imagination we currently live in. Something, perhaps, is mystical about that insight. The movie is the antithesis of the modern standard, plodding and patient, unbothered by flashy bright images or relentless comical interludes. The droll characterizations are not attractive to young minds who expect flamboyant personalities, nor is the movie’s ominous tone exemplary of the innocence of most modern fables. When it comes to balancing emotion with the looming threat of adult cynicism in the current crop of animated endeavors, only Pixar comes close to matching that austerity. But in some very indirect way, I think Adams felt that this story had arrived at a precise time, in an era when young minds needed such lessons to guide them through the darkness of an evolving world. Years of thought and appreciation have given “Watership Down” an effect of stirring transcendence, and as a movie it reaches deep into the heart of goodness, confronts great pain and then discovers the courage hidden in all of us, no matter how defenseless or meek anyone – least of all a simple rabbit – may appear. "Watership Down" is the fourteenth article in this series.